I’ve been returning the cursor to the beginning of this post for 5 weeks now. If I’ve written a hundred sentences, I’ve written a thousand; all of them the first and all of them inadequate. I love to write and I love sharing my story, but every time I sit down to write about what’s on my mind (and there’s a lot, I have more posts started in drafts than I have published over the last 4 years) I get overwhelmed by my expectations for how detailed and well researched and perfect the post has to be. So I end up working on it for a few hours and then run out of time, or steam, or just generally lose track of where I was going with my thoughts in the first place and all of the clutter just stays stuck in my head, swirling round and round, mixing with the shame about my inability to finish a post. I have always liked the idea of journaling. I especially love blank books and journals. I love the fresh, clean, crips pages, and the different headers that allow you to keep track of the date or day of the entry. I love the different covers and various pictures, or inspirational quotes intersperced between the lined pages, the smooth covers, the unbroken spines. They start out so perfect, flawless. With loves like these, you might expect me to be a prolific journaler, but I have this debilitating fear that the first word, or sentence, or page I write in a perfect, new, blank journal will not be good enough and will ruin the book’s untouched perfection. 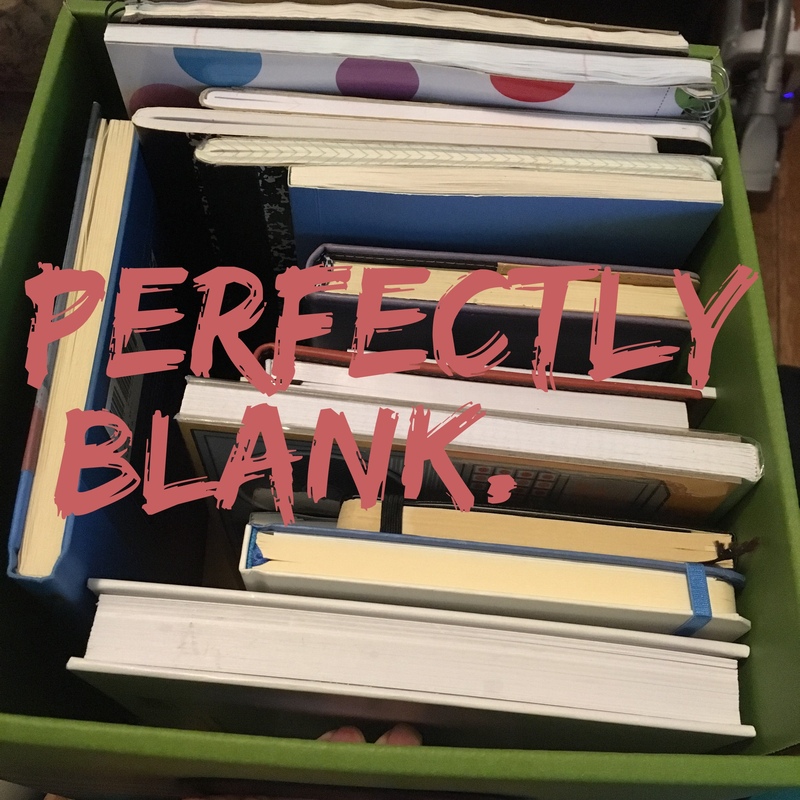 I can’t even tell you how many formerly blank books are on my shelves with one or two pages of writing, or the first several pages removed, to try to restore the tranquility of blankness. This is not even half of the blank journals and fancy notebooks in my office alone. And that’s not even counting the books with one or two pages written on. It sounds kind of crazy, when I’m trying to explain this fear of imperfection to others (except of course in recovery circles, where people understand this sort of insanity), but inside my brain it seems like the most logical, rational thing in the world. No matter how far I’ve come believing in my worthiness, I still don’t value my thoughts and words enough to believe that they enhance a blank page, rather than diminish it. This is actually one of the reasons I was drawn to blogging. It’s much easier to remove a flaw from a digital page than it is from paper. However, it is the same feeling of not being good enough that frequently keeps me from finishing a post and publishing it. I had a lot of lofty goals for this headline. I wanted it to be some grand revelation, that would get people to see that being a perfectionist isn’t a cute way to dodge an interview question about your weaknesses, it can actually be completely paralyzing. But now that I’m too many paragraphs in to put the cursor back at the top of the page, I’m recognizing that telling you about my fear is enough of an accomplishment for this post. I’m taking my power back. I am no longer willing to expend this amount of energy trying to hide my flaws. I will instead direct that energy towards acceptance. And to practice getting past the anxiety of posting something flawed, I’m going to finish and post at least 10 started posts from my drafts by the end of June. I will spend a pre-determined amount of time to finish them and then I will publish them without agonizing, checking and double checking. And that’s all I have to say about that. This entry was posted in Uncategorized and tagged blog, blogging, journaling, Mental Health, perfection, perfectionism, recovery, shame, writing. Bookmark the permalink. A wise woman I know once said, “I am not a recovering perfectionist; I am an aspiring ‘good-enoughist! '” I admire your courage. Thanks so much for this! I so appreciate the “me too” camaraderie and knowing it’s not just me. Hadn’t even occurred to me that somebody might be checking to see if I had edited o_o -_- I was just worried it would email out a notification to people who follow by email. Now I’m even more paranoid. Ha! Well hopefully my little perfection-no-more experiment will help. Thanks again for the awesome comment.